Another cracking Winter (or is it Spring?) day with good lift available for over four hours. 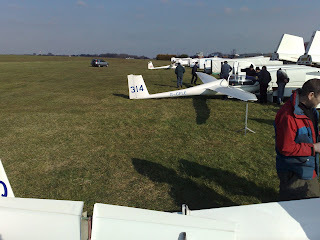 Nice to see so many were there to take advantage of 2.5kt averages, 3000' cloudbase and unlimited viz. Jim W declared booker-silverstone-enstone-booker and achieved a creditable 75kph over the 138k. Shep, Glen, John T, Ron H, and John H all went cross country whilst Peter, Arnie, Mike G, Rolf, and Don H practiced their soaring skills closer to home. Even Tim S couldn't resist a flight in the 18 while his hot ship languishes panel-less in the trailer park. Gerry and Hugh, and Mike and Will filled their boots in the 13's, soaring with the Red Kites which seemed more abundant than normal? 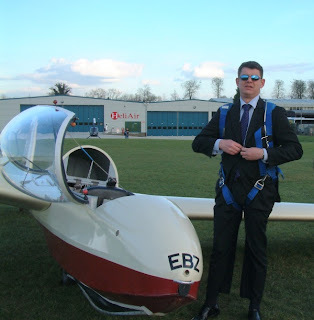 But all were put to shame when Calum turned up in full "Booker pin stripe" and couldn't resist a flight in EBZ. Nice to see the old values are still alive, what-oh old chap. 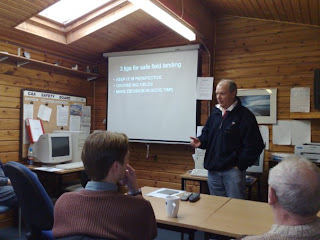 Today's lecture, given by William Parker, was on the emotive subject of Field Landings. William's larconic presentation style, along with some clever diagrams to explain various key points, made the presentation both entertaining and informative. Suitably encouraged and inspired, we left the briefing hoping to go flying, only to be thwarted by low cloud and strong winds. Oh well, there's always another day and it's the AGM this evening! Not the best of days you might think for a spot of soaring, but with a little wave in the morning and "exciting" thermals by lunchtime, everybody had some fun. A large enough hole around 11.00 allowed Will on his first flight to see how pretty the sky can be above the low scudding muck - difficult to begin to learn when there's little or no horizon, but the air was as smooth as silk above 2000'. Quite different below 2000' with turbulence to make you glad you really tightened those straps. 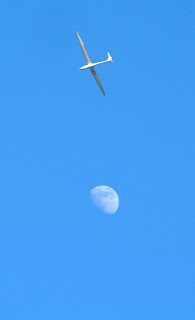 John and Mike had a little soaring in the rough thermals around lunchtime with 2's and 4's and 6's, up and down. A good day for Tanya as well who decided to sweep away those winter season cobwebs in preparation for a trip to more exotic climes. Well worth getting back into the swing of things with a check flight after the winter layoff! Well what did you think I meant..... although placing someone into orbit atop a Saturn 5 does seem rather appealing at the moment. Nominations on a postcard please. 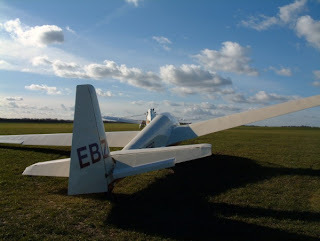 Dave S. is pictured here soaring Booker Pegase 318 on another fantastic February day. Right from the start the conditions proved exceptional for this time of year, with John H and yours truly soaring the K21 in 2-4kt thermals at 10.30am. 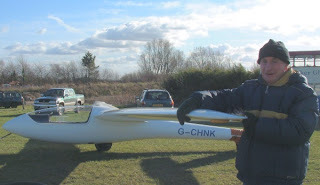 Not to be outdone Gerry soared the Junior from 11.00am for and hour and a quarter, and Roger had an enjoyable 40 minutes in the K18, whilst Bob S and I tried a few fields for size in the Falke. John B is really getting back into the swing again with 50 minutes in the K13, great effort John after your lay-off. 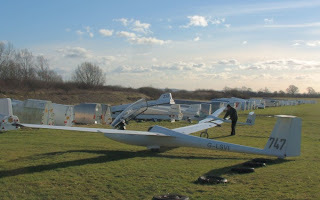 Andy B and Graham did some field landing and selection training in the Falke - good time to get prepared for the season ahead. 318 was well used today with Henry collecting all the ballast weight he could find and re-acquainting himself with the Peg. More porridge in the morning Henry. And finally, Louis' new dog proved to be a hit at the launchpoint, if not a little camera shy. 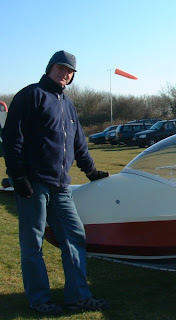 John H is pictured modelling the spring collection thermal parachute. Hmmm, Booker logo'd parachutes, now there's a thought. 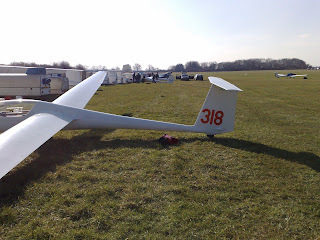 Mike Philpot did today's talk on trailer towing and glider rigging. He provided some really useful background information on trailer towing - rules, laws, do's and dont's, etc. A copy of the notes are available on the members page of the main website. 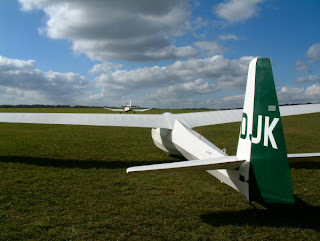 Check out the TRAINING NOTES section on http://www.bookergliding.co.uk/members/BGC3459.html. Later on he led a series of rigging/derigging sessions showing the nuances of rigging the Pegasus and Discus. All handy stuff for when many of the members want to rig and fly a single seater. Fully expecting a foggy morning I rolled out of bed and confirmed the forecast with a sneek peek out the window. Off to the cash and carry, bank and post office looked more likely than flying. Only until driving up the Marlow hill did it become obvious that the cash and carry would have to wait until Friday (perhaps). 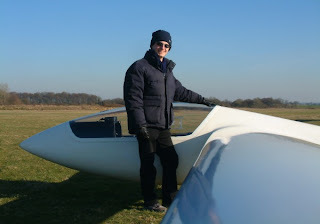 The first flight confirmed why 520' amsl and well drained chalk stands Booker in such good stead. All around the fog lay in the damp valleys, with Didcot and Benson never really clearing all day. A strong inversion kept the thermals very low but even at 10.30 the Red Kites were soaring Cressex. 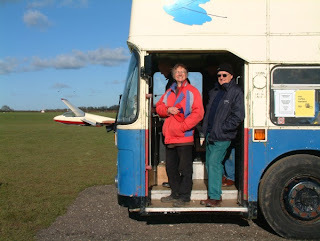 There were only seven of us who flew today, Eric, Rob, Graham, James the tuggy, Julian, John and yours truly. Pity, the views were stunning but you'll have to take my word for it as I forgot my camera. It's not all about flying, you know. 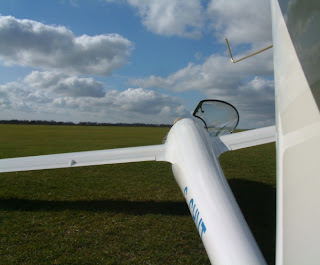 There's loads of fun to be had without ever leaving the ground. Just be careful with your fettling. Dave B, Booker's very own Health and Safety Rep can tell you all about how to hold a stanley knife, or not. Now, now Dave don't be like that. Luckily Doctor Simon was at hand to administer the medical know-how. Ouch. At this time of year we can be thankful for another beautiful day with clear blue skies and warm sunshine. I even took my coat off. Not so much in the lift department however, although Ed used what there was to float aloft in the Junior for a half hour. Spot the tug. and Jim swotted for his NPPL. Never a dull moment at Booker. I remember last April when people said "if this is global warming then bring us more!" And then May, June and July proved dreadful. The end of January and now this first week of February seem as much out of character as April '07. Let's hope that we don't end up paying for this early start to the season. But enjoy it while its here, which was definitely the motto of today's members of The Wednesday Club. With 2-3 kt average climbs to 3500' and visibility as far as the eye could see, even Jim and Shep were tempted to rig. 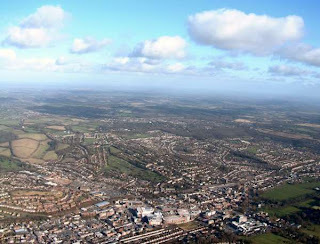 Thame out and return (undeclared) and an hour and a half around the Oxfordshire countryside sated their appetites. Martin had an hour in the Junior demonstrating to Peter, Michael and Arne how it should be done. Waiting for (willing) Martin to land. 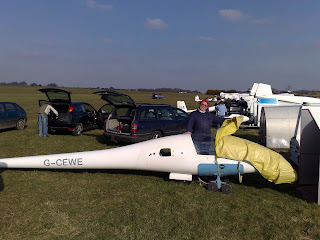 Don and Eric both had solo flights in the K13 but didn't manage to soar - plenty of time to learn this season! De-rigging at the end of a great day - almost looks like a Summer's evening! 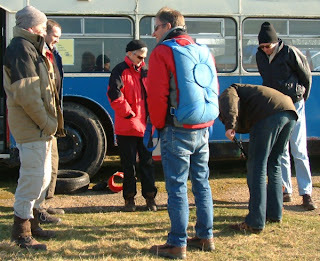 Forecasts of doom and gloom put all but a few off what turned out to be a bracing day on the airfield. Gentle early morning wave over the Hambledon valley gave 1 or 2 knots of smooth lift until the thermals took over making it a bit messy low down. Excellent viz and reasonable cockpit temperatures made a pleasant respite from the biting wind on the ground. 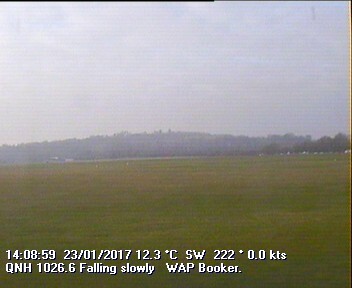 Good to see the days drawing out, the airfield drying out and members returning from hibernation or seasonal migration. Roll on Summer, but don't miss out on some Winter fun.